It’s dark outside. The moon hangs in the sky and the soft smell of smoke permeates the warm air as it stings your eyes. Looking down, you notice the glow from burning coals, as hot as 535 degrees C, scattered on the ground below. The trancelike rhythm from the beating drums fills your ears as the Patron Saints Constantine and Helen are honored in the town of Agia Eleni in Northern Greece. The whole village surrounds you and they share in your moment, as the richness of the surrounding imagery and importance of the ritual consumes the senses. You are in a sublime state of ecstasy as the glowing coals lay before you. But, will you walk across? When Saint Constantine calls you to become a firewalker – you answer – at least if you are one of the Anastenaria. In his interview with Thomas Coleman for The Religious Studies Project, experimental anthropologist, Dr. Dimitris Xygalatas, discusses his ethnography of the fire walking rituals of the Anastenaria. The Anastenaria are Orthodox Christians in Northern Greece who celebrate the Saints Constantine and Helen in a two part ritual cycle each year. They have no written texts, as the tradition and myths encompassing the firewalkers are passed down orally through story telling and by participation in ritual. Their tradition is, as Xygalatas writes (2012, p. 2) “a good example of a physically and emotionally arousing ritual, and such rituals raise a very important question regarding their participants’ motivation: why do people engage in extreme, costly ritual activities, that offer no obvious advantage but entail evident risks?” Widely known and respected for bringing experimental methods into the tough and fast paced conditions entailed by fieldwork on extreme rituals, Xygalatas combines rich description with scientific explanation to present a portrait of the Anastenaria that holds firm to the ‘anthropological attitude’ of understanding, while also providing an explanation for why people may behave the way they do. The interview begins with a discussion of the cultural context of the Anastenaria in Greece, noting widespread discrimination against their religious practices by the government and Greek Orthodox Church. He explains some of the shared beliefs the Anastenaria hold and describes the ritual cycle for the festival of St. Constantine and St. Helen. But, why would anyone be compelled to walk across burning coals? Xygalatas goes on to highlight the underlying cognitive and physiological mechanisms that may contribute to participation in extreme rituals, discusses the transmission of beliefs and revelation in the Anastenaria and highlights the importance and meaning of the rituals. In closing, Dr. Xygalatas shares a very personal moment from additional fieldwork in Spain that turned himself, the researcher, into the subject being researched. Xygalatas, D. (2012). 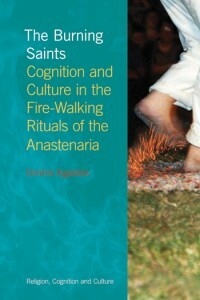 The burning saints cognition and culture in the fire-walking rituals of the Anastenaria. Bristol, CT: Equinox.